For other uses, see Polestar (disambiguation). A long exposure (45 min.) 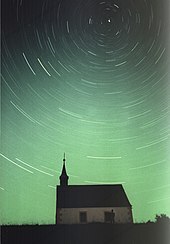 photo of Polaris and neighbouring stars, taken at Ehrenbürg (Franconia), 2001. A pole star or polar star is a star, preferably bright, closely aligned to the axis of rotation of an astronomical object. With regard to planet Earth, the pole star refers to Polaris (Alpha Ursae Minoris), a magnitude 2 star aligned approximately with its northern axis, and a pre-eminent star in celestial navigation. In classical antiquity, Beta Ursae Minoris (Kochab) was closer to the celestial north pole than Alpha Ursae Minoris. While there was no naked-eye star close to the pole, the midpoint between Alpha and Beta Ursae Minoris was reasonably close to the pole, and it appears that the entire constellation of Ursa Minor, in antiquity known as Cynosura (Greek Κυνοσούρα "dog's tail") was used as indicating the northern direction for the purposes of navigation by the Phoenicians. The ancient name of Ursa Minor, anglicized as cynosure, has since itself become a term for "guiding principle" after the constellation's use in navigation. Alpha Ursae Minoris (Polaris) was described as ἀειφανής "always visible" by Stobaeus in the 5th century, when it was still removed from the celestial pole by about 8°. It was known as scip-steorra ("ship-star") in 10th-century Anglo-Saxon England, reflecting its use in navigation. In the Hindu Puranas, it is personified under the name Dhruva ("immovable, fixed"). "by the place of this sterre place and stedes and boundes of the other sterres and of cercles of heven ben knowen: therefore astronomers beholde mooste this sterre. Then this ster is dyscryved of the moste shorte cercle; for he is ferre from the place that we ben in; he hydeth the hugenesse of his quantite for unmevablenes of his place, and he doth cerfifie men moste certenly, that beholde and take hede therof; and therfore he is called stella maris, the sterre of the see, for he ledeth in the see men that saylle and have shyppemannes crafte." Polaris was associated with Marian veneration from an early time, Our Lady, Star of the Sea being a title of the Blessed Virgin. This tradition goes back to a misreading of Saint Jerome's translation of Eusebius' Onomasticon, De nominibus hebraicis (written ca. 390). Jerome gave stilla maris "drop of the sea" as a (false) Hebrew etymology of the name Maria. This stilla maris was later misread as stella maris; the misreading is also found in the manuscript tradition of Isidore's Etymologiae (7th century); it probably arises in the Carolingian era; a late 9th-century manuscript of Jerome's text still has stilla, not stella, but Paschasius Radbertus, also writing in the 9th century, makes an explicit reference to the "Star of the Sea" metaphor, saying that Mary is the "Star of the Sea" to be followed on the way to Christ, "lest we capsize amid the storm-tossed waves of the sea." The name stella polaris was coined in the Renaissance, even though at that time it was well recognized that it was several degrees away from the celestial pole; Gemma Frisius in the year 1547 determined this distance as 3°7'. An explicit identification of Mary as stella maris with the North Star (Polaris) becomes evident in the title Cynosura seu Mariana Stella Polaris (i.e. "Cynosure, or the Marian Polar Star"), a collection of Marian poetry published by Nicolaus Lucensis (Niccolo Barsotti de Lucca) in 1655. As of October 2012, Polaris had the declination +89°19′8″ (at epoch J2000 it was +89°15′51.2″). Therefore, it always appears due north in the sky to a precision better than one degree, and the angle it makes with respect to the true horizon (after correcting for refraction and other factors) is equal to the latitude of the observer to better than one degree. The celestial pole will be nearest Polaris in 2100 and will thereafter become more distant. Due to the precession of the equinoxes (as well as the stars' proper motions), the role of North Star has passed (and will pass) from one star to another in the remote past (and in the remote future). In 3000 BC, the faint star Thuban in the constellation Draco was the North Star, aligning within 0.1° distance from the celestial pole, the closest of any of the visible pole stars. However, at magnitude 3.67 (fourth magnitude) it is only one-fifth as bright as Polaris, and today it is invisible in light-polluted urban skies. During the 1st millennium BC, Beta Ursae Minoris ("Kochab") was the bright star closest to the celestial pole, but it was never close enough to be taken as marking the pole, and the Greek navigator Pytheas in ca. 320 BC described the celestial pole as devoid of stars. In the Roman era, the celestial pole was about equally distant between Polaris and Kochab. The precession of the equinoxes takes about 25,770 years to complete a cycle. Polaris' mean position (taking account of precession and proper motion) will reach a maximum declination of +89°32'23", which translates to 1657" (or 0.4603°) from the celestial north pole, in February 2102. Its maximum apparent declination (taking account of nutation and aberration) will be +89°32'50.62", which is 1629" (or 0.4526°) from the celestial north pole, on 24 March 2100. Precession will next point the north celestial pole at stars in the northern constellation Cepheus. The pole will drift to space equidistant between Polaris and Gamma Cephei ("Errai") by 3000 AD, with Errai reaching its closest alignment with the northern celestial pole around 4200 AD. Iota Cephei and Beta Cephei will stand on either side of the northern celestial pole some time around 5200 AD, before moving to closer alignment with the brighter star Alpha Cephei ("Alderamin") around 7500 AD. Precession will then point the north celestial pole at stars in the northern constellation Cygnus. Like Beta Ursae Minoris during the 1st millennium BC, the bright star closest to the celestial pole in the 10th millennium AD, first-magnitude Deneb, will be a distant 7° from the pole, never close enough to be taken as marking the pole, while third-magnitude Delta Cygni will be a more helpful pole star, at a distance of 3° from celestial north, around 11,500 AD. Precession will then point the north celestial pole nearer the constellation Lyra, where the second brightest star in the northern celestial hemisphere, Vega, will be a pole star around 13,700 AD, though at a distance of 5° from celestial north. Precession will eventually point the north celestial pole nearer the stars in the constellation Hercules, pointing towards Tau Herculis around 18,400 AD. The celestial pole will then return to the stars in constellation Draco (Thuban, mentioned above) before returning to the current constellation, Ursa Minor. When Polaris becomes the North Star again around 27,800 AD, due to its proper motion it then will be farther away from the pole than it is now, while in 23,600 BC it was closer to the pole. Over the course of Earth's 26,000-year axial precession cycle, a series of bright naked eye stars (an apparent magnitude up to +6; a full moon is −12.9) in the northern hemisphere will hold the transitory title of North Star. While other stars might line up with the north celestial pole during the 26,000 year cycle, they do not necessarily meet the naked eye limit needed to serve as a useful indicator of north to an Earth-based observer, resulting in periods of time during the cycle when there is no clearly defined North Star. There will also be periods during the cycle when bright stars give only an approximate guide to "north", as they may be greater than 5° of angular diameter removed from direct alignment with the north celestial pole. Series of shots showing the rotation of the Earth's axis relative to the south celestial pole. The Magellanic Clouds and Southern Cross are clearly visible. Near the end of the video, the rise of the moon illuminates the scene. Currently, there is no South Star as useful as Polaris. Sigma Octantis is the closest naked-eye star to the south Celestial pole, but at apparent magnitude 5.45 it is barely visible on a clear night, making it unusable for navigational purposes. It is a yellow giant 275 light years from Earth. Its angular separation from the pole is about 1° (as of 2000[update]). The Southern Cross constellation functions as an approximate southern pole constellation, by pointing to where a southern pole star would be. At the equator, it is possible to see both Polaris and the Southern Cross. The Celestial south pole is moving toward the Southern Cross, which has pointed to the south pole for the last 2000 years or so. As a consequence, the constellation is no longer visible from subtropical northern latitudes, as it was in the time of the ancient Greeks. Around 200 BC, the star Beta Hydri was the nearest bright star to the Celestial south pole. Around 2800 BC, Achernar was only 8 degrees from the south pole. In the next 7500 years, the south Celestial pole will pass close to the stars Gamma Chamaeleontis (4200 AD), I Carinae, Omega Carinae (5800 AD), Upsilon Carinae, Iota Carinae (Aspidiske, 8100 AD) and Delta Velorum (Alsephina, 9200 AD). From the eightieth to the ninetieth centuries, the south Celestial pole will travel through the False Cross. Around 14,000 AD, when Vega is only 4° from the North Pole, Canopus will be only 8° from the South Pole and thus circumpolar on the latitude of Bali (8°S). Sirius will take its turn as the South Pole Star in the year 66,270 AD. In fact, Sirius will come to within 1.6 degree of the south celestial pole in 66,270 AD. Later, in the year 93,830 AD, Sirius will miss aligning with the south celestial pole by only 2.3 degrees. Alpha Pictoris is the south pole star of Mercury while Omicron Draconis is the north star. The lunar south pole star is Delta Doradus, and the north pole star Omicron Draconis. Kappa Velorum is only a couple of degrees from the south Celestial pole of Mars. The top two stars in the Northern Cross, Sadr and Deneb, point to the north Celestial pole of Mars. The north pole of Jupiter is a little over two degrees away from Zeta Draconis, while its south pole is about two degrees north of Delta Doradus. Delta Octantis is the south pole star of Saturn. Its north pole is in the far northern region of Cepheus, about six degrees from Polaris. Eta Ophiuchi is the north pole star of Uranus, and 15 Orionis is its south pole star. The north pole of Neptune points to a spot midway between Gamma and Delta Cygni. Its south pole star is Gamma Velorum. ^ Conversations-Lexicon Für Bildende Kunst vol. 7 (1857), 141f. ^ stella maris, sive illuminatrix Maria, inter fluctivagas undas pelagi, fide ac moribus sequenda est, ne mergamur undis diluvii PL vol. 120, p. 94. ^ a b Moore, Patrick (2005). The Observer's Year: 366 Nights in the Universe. p. 283. ^ a b c d e f Our Monthly, 4, Presbyterian Magazine Company, 1871, p. 53. ^ a b c McClure, Bruce; Deborah, Byrd (2017-09-29). "Gamma Cephei: A future Pole Star". EarthSky. Retrieved 2018-04-25. ^ "Sigma Octantis". Jumk.De. 6 August 2013. ^ "The North Star: Polaris". Space.com. May 7, 2012. Retrieved 6 August 2013. ^ Hobbs, Trace (May 21, 2013). "Night Sky Near the Equator". Wordpress. Retrieved 6 August 2013. ^ "Precession". moonkmft.co.uk. Retrieved 24 September 2018. ^ Kieron Taylor (1 March 1994). "Precession". Sheffield Astronomical Society. Retrieved 2018-09-24. ^ Bruce McClure. "Sirius, future South Pole Star". EarthSky. Retrieved 2018-01-03. ^ Archinal, Brent A.; A'Hearn, Michael F.; Bowell, Edward G.; Conrad, Albert R.; Consolmagno, Guy J.; et al. (2010). "Report of the IAU Working Group on Cartographic Coordinates and Rotational Elements: 2009" (PDF). Celestial Mechanics and Dynamical Astronomy. 109 (2): 101–135. Bibcode:2011CeMDA.109..101A. doi:10.1007/s10569-010-9320-4. 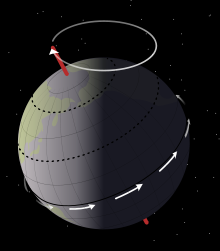 ^ note: due to axial precession, the lunar pole describes a small circle on the celestial sphere every 18.6 years. Patrick Moore (1983), The Guinness Book of Astronomy Facts & Feats, p. 29, In 1968 the north pole star of the Moon was Omega Draconis; by 1977 it was 36 Draconis. The south pole star is Delta Doradus. Look up pole star in Wiktionary, the free dictionary. van Leeuwen, F. (2007). "HIP 11767". Hipparcos, the New Reduction. Retrieved 2011-03-01.